A traditional pop up canopy can be very helpful when you're planning a neighborhood barbecue, but using one can be overkill if all you really need is a bit of shade while you and your family enjoy a meal on the patio. It's sort of like calling an exterminator to get rid of the lone fly that's moved into your bedroom. So if your temporary shelter needs are somewhat more modest, you may want to consider a Shelter Logic ShadeLogic Quick Clamp Canopy with Tilt-Mount. This unique shelter can provide you with the same kind of protection of as a pop-up, just in a smaller, more convenient scale. The ShadeLogic Quick Clamp Canopy features the same kind of tough moisture and mildew-resistant polyester cover that you would find in one of Shelter Logic's standard-sized shelters and offers the same excellent UV protection. The frame, too, is just as resilient as those of traditional canopies. It's even got a one-year warranty and CPAI-84 fire rating. You'll also find that the Shelter Logic ShadeLogic Quick Clamp Canopy is remarkably easy to use. Its tilt-mount mounting system makes it possible to attach it to a table or any other flat surface in just a few minutes. Then, once you've got it set up, it's just a matter of adjusting your canopy's height and having a seat. You can even change the angle of the canopy in order to get the best possible sun protection. And when you're done for the day, you can simply pack it up into the included storage bag. If you're not trying to entertain an entire football team there's no need to buy a tent big enough to house one. 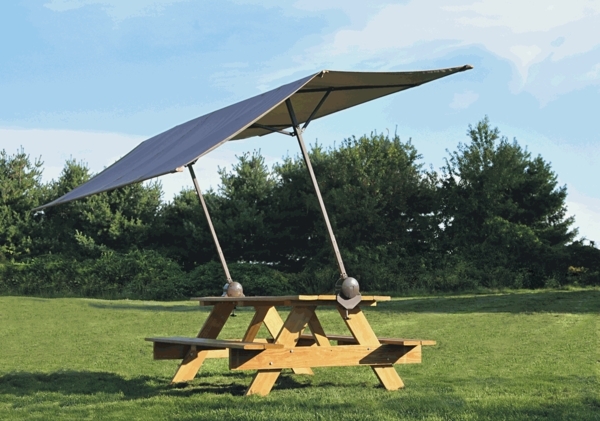 This Shelter Logic ShadeLogic Quick Clamp Canopy is the perfect choice for those seeking shelter for more intimate outdoor gatherings and spontaneous picnics in the park. It offers all of the weather protection and reliability you need without any excess bulk. No, it is not 100% waterproof, only water resistant. Would the clamps on this be suitable to clamp onto standard round fence rails? The brackets are made for attachment to flat surfaces. Constant movement from the wind and poor construction led to several problem areas after 6 months. The material faded and had wear holes. It creaked with every gust of wind which was annoying as hell. When a storm finally put it out of it's misery, I was almost relieved. It did do it's job for about a year though and was nice shade from the beating sun. Great concept if only it wasn't a cheap, China-made piece of crap. Slightly better materials and construction and it would be a winner. ProsIt shades you from the sun and is adjustable. ConsEverything I listed in my rant.